Botox® is a neuromodulator that works by weakening the muscles of facial expression which insert on the under surface of the facial skin. Once the resting tone of these muscles is weakened, the pull of the muscles relaxes and the skin flattens out. This is an entirely different approach to treating the aging face. Collagen and fat injections, as well as other filler materials currently in use, work by filling in a wrinkle. These fillers are not as effective as Botox® in removing wrinkles in the upper third of the face. By physiologically weakening the muscles, the wrinkles are removed naturally. Botox® takes three to five days to take effect and lasts between three to six months. It is most effective for wrinkles in the upper third of the face, the forehead lines, Crow’s feet and frown lines. It is not effective for wrinkles in the middle and lower portion of the face. While weakening these muscles will eliminate the wrinkles, it will also distort your smile and facial expressions. 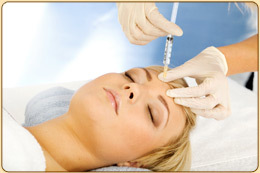 Botox® is applied through injections using a very fine needle. There are no serious side effects associated with the use of the toxin with the dosages that we employ. On rare occasions, the injection may cause a slight bruise at the site that can last for a few days. Side effects can be caused if the toxin migrates from the injection sites. For this reason, we ask that you not to rub or massage the area for twelve hours after the injection. Possible side effects include a small droop of the eyebrow or upper eyelid. Fortunately, if this occurs, it is temporary but may last two to three weeks. Botox® has been used in a safe and effective manner at a much higher dosage for patients with neuro-muscular disorders for approximately 30 years. Botox® is utilized to enhance your appearance and is not to take the place of standard facial plastic surgical procedures such as face lifting, blepharoplasty and chemical peeling. It has the ability to improve areas that are not addressed by these operations and is an effective adjuvant to these operations. When the effects of Botox® start to wear off, you will notice a return of your wrinkles. Frequently, when they return they are not as deep. At that time, you may want to have the area re-injected. It takes two or three injections a year to maintain the appearance you will achieve from Botox®. Some wrinkles of the face are not amenable to correction with Botox® injections. These are the deep creases that are in the structure of the skin and not caused by the muscles pulling on the skin. These types of wrinkles are the result of trauma, scarring or sun damaged skin and frequently found in patients over the age of 60. Botox® works best in patient’s aged 30-60.